It can be frustrating when the solution to one health problem aggravates the symptoms of another. I’m referring to bladder stones and an enlarged prostate. 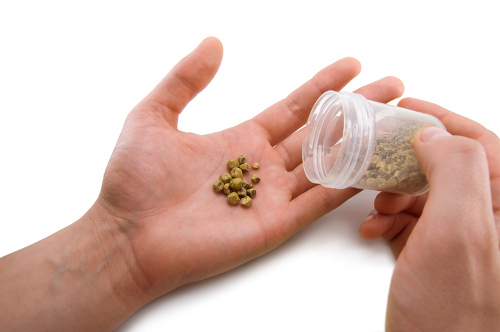 Bladder stones form when the urine in the bladder gets highly concentrated because of dehydration. Or, because the bladder cannot empty completely, thanks to a weak bladder muscle or an obstruction to the flow of urine. In most cases, the cause of the obstruction is an enlarged prostate. So, it’s not surprising that a whopping 95% of all bladder stones occur in men. The most common symptoms of bladder stones are frequent urination (especially during the night), lower abdominal pain, a burning sensation or pain in the urethra when urinating, and cloudy or bloody urine. If left untreated, bladder stones can lead to infections and other complications, so it’s best to nip the problem in the bud. The common procedure (cystolitholapaxy) breaks bladder stones down using an ultrasound device or a laser beam. But, if the issue isn’t severe, I’d try these six effective home remedies first. Mix 10 milliliters (ml) of pineapple juice, 10 grams (g) of sugar candy, and 10 ml of rose water, and let it sit overnight. Drink the mixture on an empty stomach. Boil 6 g of horse grams and 25 ml of extracted radish juice in 125 ml of water. Strain it and drink the liquid first thing in the morning on an empty stomach. Eating watermelon seed kernels daily will help break down the stones so that they can pass through the urine. Boil 20 g of vine leaves in a cup of water and filter it. Then, mix in 20 ml of grape juice and drink it after dinner. Dissolve the paste made from both ingredients in a glass of water. Drink it once a day until the stones go away. Drink 5 g or one ounce of extracted onion juice every morning on an empty stomach. The bladder stones will dissolve quicker if taken daily. As concentrated urine triggers stone formation, it makes sense to drink more water to keep the urine diluted. I know this can be a problem if you’re already suffering from frequent urination caused by an enlarged prostate. So, here’s what I’d do. Drink a lot of water during the day to flush out the bladder as many times as possible. Then, as evening approaches, cut down on the water intake, so that you don’t get too disturbed while sleeping at night. “Bladder Stones,” Mayo Clinic, October 22, 2016; http://www.mayoclinic.org/diseases-conditions/bladder-stones/symptoms-causes/dxc-20233507. Bano, M., “NATURAL TIPS FOR URINARY BLADDER STONES,” Natural Fitness Tips, April 16, 2017; http://www.nftips.com/2014/01/natural-tips-for-urinary-bladder-stone.html. “How to Prevent and Get Rid of Bladder or Kidney Stones?” Simple Remedies, August 29, 2011; http://www.simple-remedies.com/home-remedies/kidney-stones/bladder-stone.html. Macon, B.L., and Solan, M., “Bladder Stones: Pain, Symptoms, Treatment, and More,” Healthline, February 24, 2016; http://www.healthline.com/health/bladder-stones#Overview1.